Well, this time - we remembered the big syringe. So we passed that crucial check-point. The last Sunday in October, we went to church with my mom & dad. They're fairly recent members at that church, but are still reasonably-well plugged in. But, for context - "they're new there". Anyway, their service starts at 10am. This is also Evelyn's mid-morning meal-time. I figured it would probably be easiest to just use the Big Syringe to push food in while sitting in back, instead of breaking out the whole feeding pump & bag apparatus. So, thusly prepared, we headed off to church. Mom & dad went ahead and saved us some seats at the end of a row in the back, so we could get out easily if need be. This later proved to be a fortuitous decision, but at any rate, we went in, got settled, and the service began. We sang some songs & hymns, and many of the normal "churchly" things, and then about 10:15, settled in to begin feeding Evelyn. It all seemed too easy - Evelyn was sitting quietly & contently in Kim's arms; I was pushing the food in with the syringe; 2.5 mL every 30 seconds or so. 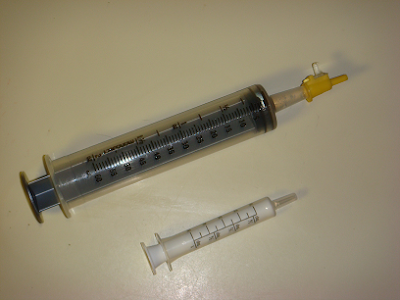 This Big Syringe was an even bigger syringe than that last Big Syringe (see the image above; contrasting it with a regular 5 mL syringe) - this one holds 2 oz (60 mL), instead of 1 oz like the old Big Syringe. It was a little tougher to push in, but I attributed that to maybe a slightly-narrower NG-tube (Evie has a new type of tube), and/or the fact that we were using an adapter for the syringe, as the syringe's tip was a bit too large for this new NG-tube. In any event, other than that, all seemed well and Kim and I were both having an "aren't we a happy little family" moment. The singing wound down, and the preacher had just begun a prayer. Another 30 seconds had elapsed, so I casually began pushing in another 2.5 mL. Recall, this is in the middle of a prayer at a church service, so it was like the "Psssssfffffft" heard 'round the world, as far as we were concerned. We watched in horror, as in slow-motion, the adapter broke free from the tube input. However, motion & time were not, sadly, slow enough for me to release my fairly stiff pressure on the plunger of the Big Syringe. As one might imagine, this course of events ended up sending a big, fat stream of KetoCal shooting across Evelyn, Kim, my dad, and an innocent bystander seated diagonally in front of us. I'm pretty sure we also misted some other bystanders. Taking an aside, to help you comprehend the magnitude of this Rain of KetoCal - I ran a small test at home, after all events had transpired. 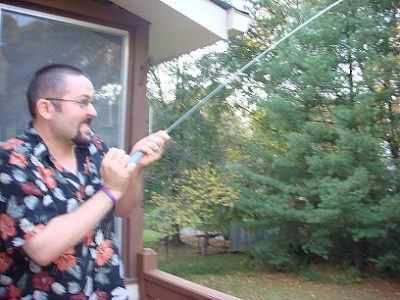 I loaded the Big Syringe up with water, put the adapter tip on, and shot the water from my parent's back deck clear across their back yard; a healthy 20 or 30 feet. So there's some power there. Needless to say, back in church - time began to speed back up. Quickly. Dad, dripping with KetoCal, started to hee-haw (and grin like an animal that hee-haws) from down the row, while the poor lady in front began to process that she'd just been splattered with an ample barrage of formula. "That's strange... I'd swear I was just hit with a fire-hose. Only one that dispenses baby formula. Except I'm in church. Wrapping up a prayer. Interesting." Luckily, she was also the mom of a 1-year-old, so "she understood" - most graciously. Perhaps even more luckily, she was wearing a water-resistant jacket, so most of the would-be damage was easily wiped off.